The event was at the V&A Museum. Below, museum director Dr. Tristram Hunt greeting the Duchess along with Jane Davis, the Vice Lord-Lieutenant of Greater London. Kate is the Victoria and Albert’s royal patron. The Duchess waving to well-wishers gathered in hopes of seeing her tonight. This quick video by Rebecca English offers a sense of how the skirt flows. 100 Women in Finance, previously known as 100 Women in Hedge Funds is a leading non-profit organisation for professionals in the alternative investments industry. Each year, 100WF’s Board of Directors selects a beneficiary for its philanthropic initiatives, which cover women’s and family health, mentoring and education programmes. 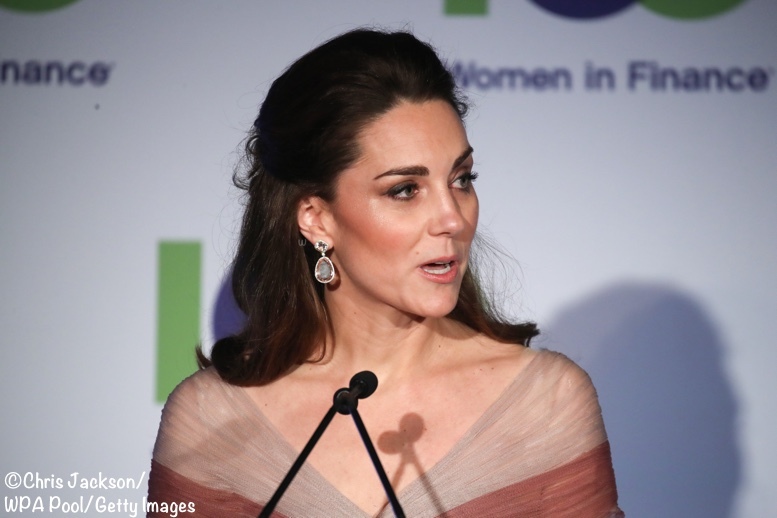 The Duchess is a patron of 100 Women in Finance’s Philanthropic Initiatives, joining Prince Harry in that role in 2012, along with Prince William, who has been a patron since 2009. Here you see her with Amanda Pullinger, Chief Executive of the organization, and Lauren Malafronte, the Board’s Chair. The function was a fundraiser for the Royal Foundation’s “Mentally Healthy Schools” program and Kate was the guest of honor. A video from Emily Nash showing Kate descending the staircase as seen above in the still. Following dinner, the Duchess delivered remarks. I have often been asked why I have decided to focus my work on the early years. Having been lucky enough to meet some of our country’s amazing charities and organisations, tackling some of our hardest social challenges, I became acutely aware just how important the earliest years of our lives really are. We’ll start our look at what the Duchess wore with her Gucci evening gown. The off the shoulder design featured an intricately ruched bodice and a floaty, flowing skirt in layers of pleated tulle. Kate accented the waistline with a velvet band. It looked like Kate was in her Cabrina pumps by Oscar de la Renta in the ‘platinum lamé’ colorway. The point-toe style features scalloped sides, a raised back and 4″ heel. She carried the Prada clutch we first saw at Princess Eugenie’s wedding. NOTE: The clutch shown below is the basic Prada style that we think was customized in velvet for Kate. Thank you to Gabriella for pointing this out, I originally forgot to include that in the post. Kate’s hair was worn down. 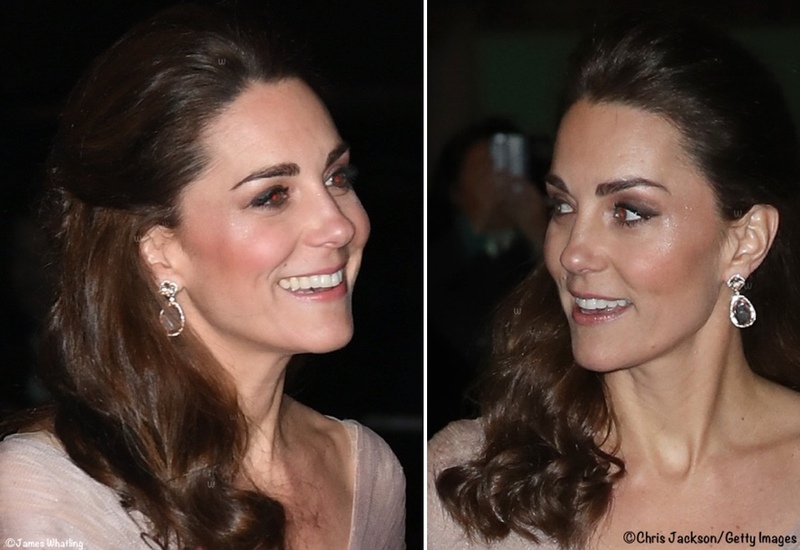 She wore the morganite and diamond earrings by Kiki McDonough that were worn at Pippa’s wedding. This is the fourth 100 Women in Hedge Funds/Finance function the Duchess has attended. In 2011 she wore a gown by Beulah London; in 2013 we saw the inky blue Jenny Packham; for the 2015 event, Kate wore the much-discussed Erdem Alouette gown. A look at the Duchess as she was leaving tonight’s dinner. And this piece is from The Telegraph’s senior fashion editor, Charlie Gowans-Eglinton. After Dolce & Gabbana’s advertising campaign – released in the run up to the show- drew allegations of racism, comments made on the brand’s social media accounts added fuel to the fire. The brand’s founders later released a video apology. Scandals like this are nothing new in fashion – but the public response to them has changed. Social media means that news spreads fast, and globally, and puts the power in the hands of the consumer. Now everyone has the platform to call out brands for their behaviour. Sometimes a dress is just a dress. But I’d argue that in the current climate, it’s so much more – and perhaps even a Duchess needs to be ‘woke’. There is no way of knowing if Kate is aware of either issue. And as pointed out by SG in a comment, there is an enormous difference between the ongoing years of D&G issues and Gucci’s situation. I have had a few emails and messages asking how often Kate has worn either/both brands. Kate has worn Dolce and Gabbana with some frequency, including royal tours and other engagements. It has also been a choice for Wimbledon and Royal Ascot. As best I can remember, the only other time we have seen Kate in a Gucci garment was for a June 2017 engagement that was also at the V&A. She has also carried a Gucci clutch. If you missed this morning’s coverage of the Mental Health in Education conference, click here to read that post. God, I LOVE this dress. No-one knows of any cheaper but similar alternatives, do they? I’m amazed to see so many negative comments about this dress, it’s stunning. For me one of her best, I love everything about it and she looks beautiful. Where and how can I buy this dress? Yes, I can afford it. A late comment on this look. I think Kate looks stunning. The photo of her leaving the event is just beautiful. The gorgeous movement in the fabric and the soft colour palate seem lovely to me. I thought her accessories were spot on. While I can see why some thought the darker shoes would look good, personally I thought they would have drawn attention to Kate’s feet rather than the dress and her overall look. She really looked like a princess here IMO. Bravo Kate. Love the look overall. The bodice was a touch short for her torso which can happen when you are tall on top. If it were a couple of inches higher it would have been perfect. It’s very possible that something happened to what she was gong to wear and there was a last minute switch. As to the brand challenges, she’s a working mom and probably had just enough time to prepare for the event / write speeches and work on her other assignments. It would have perhaps been wiser if her office had realized the fashion connections and they probably had a bit of post event scramble, however, it’s certainly no fault of her’s. Adore the BAFTA look. I would not put Gucci in the same convo as D&G. Both Dolce and Gabbaba have made sexually and racially insensitive remarks on the record starting I think after the Obergefell SCOTUS decision. I applaud the Duchess for a fresh and fashion forward silhouette, and for mixing up her designer base. The colors are lovely and chic although perhaps a bit more appropriate during the summer with a tan and and updo. The fit confounds me. I am also tall so I’m used to darts hitting me in the wrong place but I have to assume this gown as tailored for the Duchess and so I cannot explain why the contrasting fabric is placed to drag her bustline down. I think sometimes the problem with very high end designs is that they are more about a designer’s vision than they are about flattering the wearer. And that is kind of the point of high fashion, but I think the best designer knows how to walk the line. I am super late to this because I’ve been traveling, and I haven’t read all the comments. But my initial reaction was–why not the burgundy velvet pumps that go with this sash and clutch, that she wore with the tweed Erdem recently? I just can’t look at this outfit without longing for those pumps. It doesn’t help that I really dislike the glitter heels. I like the dress quite a lot, but I agree with others that it is having a strange flattening effect in the chestal area. I absolutely agree with you about the burgundy velvet pumps, they would have been perfect here. Like most others, not crazy about this dress or the shoes but she always looks beautiful regardless. I wasn’t “up” on the D&C controversy so I Googled it. What were they thinking??!! Just. Wow. That being said, Kate is well within her right to wear their clothing even if this particular dress color wasn’t very flattering IMO. Catherine is always lovely, but his dress is not. The raspberry jam tone is particularly unbecoming and the top of the dress minimizes bust line. Just not one of her best looks. She has looked so fabulous since returning from maternity leave, so I’m sure the next ensemble will knock it out of the park! Look, soon we will all be sheltering in our homes and remaining totally mute for fear of “offending someone”. Grow a backbone and save being offended for the really egregious offenses, they happen daily as well (wage inequality, job discrimination (which works both ways), housing discrimination). Don’t buy the sweater, don’t buy the brand. If people keep getting hysterical over small things it loses it’s effectiveness overall. Good Lord, I’m offended daily and somehow I carry on. And yet you would prefer for those who see a connection to a racist past (or present) to remain mute about it so that they do not cause discomfort to others? As always, it is important to remember that freedom of speech goes both/all ways. If one’s defense of it tends to focus repeatedly on the same perceived victims and the same perceived perpetrators, it is probably an imbalanced view. In the end, it is never irresponsible to share the facts and let readers decide where they stand, which is what the admins have done here. They also seem to be publishing all the comments, even the ones that more or less date them to publish it, which I am not sure I would treat so magnanimously if I were in charge. I have enjoyed this website so much over the years, partly because it was a break from all the hubub and negativity everywhere else. Over the past year it has turned more political, and I am sorry for that, but respect that it’s not my call to make. There are certainly plenty of concrete social ills associated with fashion, if one chooses to focus there — including conditions associated with diamond mining and sweatshop clothing manufacture. It was a fun break to just enjoy the sparkle or the off-the-rack fashions. I am pleased that Catherine seems to deftly sidestep controversy and keep her focus on organizations trying to do concrete good works. As for this dress, I find it is growing on me. Who knows, it may wind up as one of my favorites by the time it appears in a poll. I am wondering if the chest band were to loosen and widen at the shoulder, in echo of the widening strips in the skirt, would that maybe have softened the style a bit? She certainly can wear everything beautifully! I have been wondering if the bodice had all been the darker colour if that would have made it more appealing. Perhaps only to me as not everyone likes a multi-tone outfit. A solid colour would have alleviated the contrast of the bust. I like the style of the gown and it is also growing on me as a very beautiful gown with some contrast that not everyone loves. I love the dress and the colors. BUT, I think the darkened bra like part of the dress is tacky for the future queen. This should have been the same color as the rest of the bodice. Like a lot of people, this isn’t my favorite dress she has worn. When I first saw it, the two toned pattern threw me off especially the criss cross at the bust. The skirt is more subtle so I like it but the top is just a no for me. It also just seems like a lot of material and very restrictive, like she’s trying to bind her bust and keep it flat. And it just seems restrictive on her arms too. Not loving the velvet belt either. The earrings and the shoes are nice. But it does seem like Kate stepped out of her comfort zone with this dress. As for Kate’s choices to wear brands that have been under fire, I really hope she (or her team) does more research on brands she chooses to wear in the future. Gucci I can understand as the incident just happened this week and she probably had planned that outfit for awhile. But D&G is a label that has consistently generated controversy over the years and anyone who has paid attention to fashion would know that. And to call her out on wearing the label when D&G’s missteps involving the gay community and people of color isn’t political in my opinion–it’s drawing her attention to something she should be more aware of and I see that as a good thing. Sometimes clothes aren’t just clothes. What if she stepped out in Marchesa, the brand of Harvey Weinstein’s ex-wife? I know she hasn’t worn it before (and quite honestly I find anything by Marchesa to be ugly) but many actresses came forward to say they were forced to wear Marchesa when promoting a Harvey Weinstein movie. She knows not to wear it. If she has enough sense to stop wearing Issa, then she should have enough sense to research fashion houses more carefully. You might want to read Gucci’s response to the sweater controversy. There is a link in a post below. Gucci made a mistake. They have owned it and set out a plan to help prevent future mistakes. I can see no reason why Kate should criticized for wearing the brand. I believe Kate has worn Marchesa. If I remember correctly a pink evening gown for a State dinner? As they are now divorced, and to the best of my knowledge the wife was not involved in the abuse, it would seem wrong to punish someone for the sins of their ex spouse. I forgot she had worn Marchesa so thanks for the reminder. But it seems she hasn’t worn the label since the Weinstein debacle. Hi, Amelie, and thank you for commenting. Kate actually has worn Marchesa; a Notte dress in April 2017 and a Marchesa gown for the Spain state dinner in July 2017. That situation, as well as Gucci’s, are in a different category for me when compared to D&G. Unfortunately, there is an ongoing, established pattern to the Dolce & Gabbana behavior, as you reference. I often wonder where political correctness/social-justice-warrior/social consciousness/call-it-what-you-will is going to end – should I be googling clothing labels from the dressing room to make sure they are appropriate to purchase? Should I boycott department stores that carry “inappropriate” labels? Stop reading fashion magazines featuring their advertisements? This little debate brought to mind two others who are pretty notorious, Messrs Lagerfeld and Galliano, and a quick Google search showed that Stephen Jones, milliner to the RF (including Meghan), collaborated on the Galliano show last autumn – does that say something negative or despicable about Jones? Vogue covered Lagerfeld last autumn as well – time to chuck the subscription? And this is just the fashion front – the news from Google, Facebook, Amazon, Apple etc lately has been very negative as well. Am I to assume that any sensitive, self-respecting human has disengaged from FB, no longer owns an iPhone, doesn’t order online, etc etc etc? How utterly exhausted I would be if I had to research and mull over these decisions. The comments section here makes it quite clear that many, if not the majority, had no idea that there was any conflict with D&G. Additionally, as the designers are out and proud, am I going to be called out for homophobia if I shun D&G, or applauded because they make outrageous statements about other groups? Again I ask: where does it end? @JR, I think this is a really good point. You echo my underlying thoughts as I wrote below. While I think we should all be conscientious about purposefully offending people with our own actions, I do feel the amount of criticism leveled at many different people (and entities) from a multitude of perspectives is becoming, frankly, too much. As a business, it seems, you cannot tread lightly enough–there is no IF but WHEN you offend someone. I would also like to point out that I am a member of a minority myself and there have been times where I have felt discriminated against. And even with those (albeit minimal) experiences, I strongly maintain that excessive political correctness and the current “outrage culture” is the opposite of helpful or necessary. I couldn’t agree with you more. Very well said. The Duchess of Cambridge wore a lovely bespoke gown and looked beautiful in it. If you look at this situation as voting with your dollars for the kind of world you want to see, perhaps it makes more sense to you. I don’t have a lot of money to spend on clothes, so my choices of clothing from brands that are environmentally conscious and made by fairly paid adults in safe working conditions are not having a huge impact. But somebody like Kate CAN make a big impact by the brands she chooses. And in fact, she has! Thank you! Being sensitive to others and holding people to account when they do things that are disrespectful or dehumanizing does not seem like “political correctness run amok.” At the same time, people make mistakes and should be allowed to correct those mistakes. Trevor Noah made an interesting comment on Stephen Colbert the other night. They were discussing black face and should a politician resign for having gone in black face to a party many years ago. He basically said no, not if he realizes what he did was wrong, apologizes for it, and learns from the experience. Noah pointed out that we need to have more conversations. Declaring racism is over and all are equal doesn’t work. We need to talk about things when they come up so people can learn. That is exactly what Gucci appears to be doing, but if no one had called them out, if no one had made a fuss, the conversation would never had started. Learning and understanding come from those conversations. I agree wholeheartedly with you, Maggie! Thank you for voicing this sentiment. We all make mistakes, have lapses of judgment, say things that end being hurtful to people me had no intent to hurt. We need to be willing to examine the issues, and ourselves, when these things happen. having the conversation is what it is all about. I commend admin for acknowledging the issues and allowing the conversation to proceed. It has been very enlightening. Beautifully put, JR, thank you. I confess I am among those pretty much in ignorance of these latest fashion controversies having been much distracted by other news events of late. My own view is these are news stories which will have as short a self-love as all the rest and we move on to the next. Lovely dress. Unlike some others (whose opinions I very much respect) I actually think these shades of mauve and blush look very well on Kate. I do feel that the dress has grey-ish undertone which may not be to everyone’s liking, but I think the color combination looks nice on her creamy skin tone with her luxe bouncy hair. As to the dress designer scandals, I am vaguely aware that Gucci and D&G have made some questionable decisions both with product and advertisement. And I would guess that Kate was unaware of them or at the most only vaguely aware like myself. The thing is that I feel our culture is far to easily “outraged”–and sadly, sometimes I am guilty of it too–of being too easily offended. High fashion designers are artists and often an “artist’s” perception of appropriateness and politeness is not quite what every one else might agree with. I’m not sure that is a great excuse, but it is common throughout history that artists have been given much more leeway (with regard to decorum and suitability) to express themselves and practice their craft than professionals in other industries. I had not heard about either the Gucci or Dolce & Gabbana scandals, so thank you for bringing them up. I agree that the situations are quite different and Gucci has actually taken concrete steps to correct the problem (including the CEO’s letter stating what the intentions behind the design were, while acknowledging that different perspectives mean a design that was intended to be harmless may really come off as offensive) and Dolce & Gabbana don’t seem to even understand why what they’ve done was wrong. I have really liked some of Kate’s D&G designs but now knowing of all the founders’ awful comments, I’m rather disgusted with the brand as a whole. Why D&G hasn’t invested in a good, professional PR team is beyond me. Now, the dress! I was excited to see this dress on Instragram shortly after the event. It has a lot of features similar to the inky Packham, one of my favourite Kate evening gowns, while still showcasing a lot of unique aspects. The colours are divine and the velvet belt with matching bag really make the look; I think the whole dress would be a bit washed out without the colour contrast. I’m not a big fan of the shoes – the concept is great but I feel they photograph poorly and look rather cheap as a result. What a fun look to see from Kate, and now I so wish a dress I tried on last weekend in similar colours had had a more flattering neckline so I could have had something like this in my closet! And thank you for sharing the photos of past 100 Women in Hedge Funds/Finance events, I’m always excited to see that floral Erdem gown again. One of my favourites and a dress that never ceases to stand out in my mind when I think of some of Kate’s most memorable looks. That floral Erdem did not find a lot of love, but I agree with you, Larissa, it was one of my favorites and I loved seeing it again. Whether Kate will ever wear it again is the question! 1) I am happy with the discussion of the cultural and political aspects of Catherine’s fashion. I think that fashion plays such an important role in communicating our values, heritage and character, and fashion inevitably occurs in a cultural context. We can discuss a design house that has an uncomfortable history, and how that might impact how we perceive Catherine’s style choices. This is not meant as a criticism of Catherine, and I’m sure she just chose clothing that she found beautiful and appropriate for the event, and designers she felt suited her personal style. I don’t know anything about either fashion scandal. All I know is that I don’t feel uncomfortable or threatened by discussing these topics. 2) As for the dress, I love pieces of this dress, including the rose color and the skirt, but dislike other parts. Altogether, it is an unusual, beautiful look, and she looks happy and lovely. I agree with this being a “one wear only” dress. Thanks for putting it into words! I feel like this dress doesn’t have the timeless appeal that many of her plainer, less unique Jenny Packham dresses do. The criss-cross accent across the bust might look dated in a few years. I love Kate, her elegance and grace. However, this dress does not become her, in my opinion. The colour washes her out. Sorry, but is there any colour frumpier than dusty rose? To wear that neckline, one needs a more fulsome bust line. The belt is a nice touch. A weak following to her last white stunner at the BAFTAs. I’m sure it is tough to find the right balance among regal, flattering to her body shape, and age-appropriate. This one is a drab miss. If Kate had a bigger bustline, we’d all be saying how inappropriate it would be to show so much cleavage at this event. I know that 100%. She gets away wearing a lower neckline precisely because she isn’t very “ample” for lack of a better word. I do too in fact! 🙂 A blessing for small chested gals. I am sorry to have to agree. The dress might be a knockout on another person, and the Duchess always looks ok, but it’s not a home run. If the colors were reversed, it might be much better for her! I find this dress beyond strange. The colors are pretty and the skirt design is flattering, but the bodice looks like it was wrapped up to appear completely flat. It’s bizarre. This gown is a lovely colour. I am still not sure of the criss cross look across the breast area. The flow of the fabric is gorgeous…Kate looks at her best in evening gowns that flow and drape. I think that cut suits her long torso. I don’t know if this is the place to leave this, but here is a response from Gucci about the sweater and the controversy. https://fashionista.com/2019/02/gucci-blackface-sweater-alessandro-michele-statement I think it is an important read because it discusses the actual inspiration for the design while taking responsibility for the fact that it ended up being unintentionally hurtful. I realize that it is often the reaction to say “Kate shouldn’t be supporting this brand.” I hope that in this case, given the fact that Gucci appears to have accepted responsibility, apologized, and is taking steps to help prevent something like this from happening in the future, it can be used as a learning moment both for the importance of cultural sensitivity and also the importance of understanding that people can and do make mistakes. Without mistakes we will not grow and learn. It is now mistakes are handled and if lessons are learned that should, IMHO, determine how we support or withdraw support from an organization or person. Thank you for linking to the story. I thought their response was outstanding, so very different from the ongoing D&G behavior. Appreciate your post. Thanks for sharing. The more I look at this dress the less I like it. I almost think it was modified for modesty. It’s too long and doesn’t move well. I think it’s really only her earrings that I like. Those earrings are so beautiful! They are a stand out. On the fence about the outfit but only love for those Morganite earrings. I just have to comment (my first) to say this look is stunning. I wouldn’t change a thing! I think her styling has been on point, since returning from leave. Thank you, admin, for mentioning the controversies surrounding the designers, without passing judgement. If the white gown hadn’t bowled me over so much, I might like this one better. And I do like it…I think…the bust just makes me go “Hmmm.” I agree that it looks like a bra or bust-binding; it certainly draws attention to her bust. The straight-on shots show the belt and bust visually breaking her figure up in a way that just isn’t flattering. When I saw the side view in one of the videos, I thought it was more flattering. Personally I like the colors and the floor length, and even the velvet belt would probably have been ok by itself. I can’t call all that floaty fabric a “miss,” but I wish they’d done something a little different at the top. Kate is as always, beautiful, and graceful. But this dress is anxiety inducing to its length, and reflected in the above comments. I scrolled through the photos holding my breath! She stands on it in one pic, and in the staircase one, it looks like she’s snagged or scrunched it near the hem. She could totally pull of tripping, or ripping her dress, with utter grace and elegance.. but I feel like I’m watching less with popcorn and, more with my eyes half shut. I’m a huge fan of Kate and I like her style, but not for this event. Every time she makes a strange choice. It’s beautiful, but too long. All I see is a tripping hazard. In one of the first photos, she is standing on it. Not a good thing. Three major outfits plus a gardening outfit, in two-three days! A lot for Admin. to get out to followers of this site! Thank you! As for this dress, it is not at all flattering in the bust area. My mother often spoke about how she had to put a binding around her breasts to fit into her 1920’s flapper dresses, which were supposed to hang flat – and how much pain she had in later years from that process. I would presume that this bandeau effect might not be as onerous, but it really is not too flattering. Kate’s straightforward stride style so nicely activates these long skirts (and I hope she won’t trip on that long hem! ), and overall – since Louis – she has really stepped up her dressing. Certainly at the evening events of the last few days, her comparatively simple but strikingly tailored outfits make the evening dresses of others seem ill-fitting and too busy. Wonderful to observe – and obviously for all of us, readily leading to extended commentaries! Thank you, Admin. Well, we knew that Sunday’s gown would be a tough act to follow, so I am not as disappointed with this gown as I might otherwise have been. In fact, it’s a pretty okay gown except for the chest-minimizer bandages over the bodice. I found them completely distracting as I tried to figure out what was supposed to be going on there. The belt could have been better positioned but I liked the dash of strong color there. I am in the camp of those who don’t think Kate has to dump a designer because s/he made one misstep. Not commenting on D&G because I have heard nothing about whatever they have done but good for Kate for not overreacting on Gucci, assuming she has even heard about their unfortunate sweater design. OBSESSED!!! I don’t even have words for how much I love it! Possibly my new favorite! And, I can’t stop adding exclamations!!! The Duchess looks lovely. Not a fan of the dress, the bodice I am not a keen on. The clutch is gorgeous, earrings and shoes look fantastic. I feel quite the opposite about the dress then most of the commenters: I think the color is very nice and suits her well. The waist band is definitively a beautiful add-on. Overall I am not a big fan of the dress because to me it is from a fashion point not really interesting. It is a bit one-in-a dozen. The flowing chiffon is beautiful of course, but not really what I would call “design”. I much more prefer the blue Jenny Packham dress she wore to the premiere of new James Bond flick Spectre in 2015. It was so much more novel. Well, I have notes about the bodice — a little too bandage-dress/binding/flattening — but I still on the whole like this look. The colors are exquisite. Susan, I gather from your post that Kate added the velvet band herself? I think that was a pretty good call — it’s such a lovely color with the dress and pulls in the minaudiere without being too much matching color. I’d be curious to see this dress without the belt too — although I do really like the belt — and I’d love to see it with a soft, romantic updo and with a necklace. So I guess I’m hoping we see it again in various ways! But despite the notes, I did enjoy this. Such pretty colors, refreshingly different while still following a silhouette the duchess favors, pretty shoes (love that the bag and belt matched but not the shoes — Kate can overdo it with the matching sometimes), and pretty makeup. Black face is primarily a north american issue. Dolce and Gabbana are Italian and Kate is English. Blake face as an issue would not even register on their horizon. Kate is also not dressing to please a US public but primarily a British and European one. I thought the dress was very pretty and the colours suited her well. Blackface is not just a North American issue. If you will remember the Princess Michael wearing an extremely offensive blackmoor brooch to meet the now Duchess of Sussex, you will see that racism is alive and well in the UK. Or just check out the comments section of any Daily Mail article about Meghan. Further, Dolce & Gabbana are Italian designers and therefore well within the realm of “European designers” and a European audience. It’s not off the wall to assume Kate might have heard of their ongoing years of problems addressing racist issues as well as the more recent problems and consider removing them from her extremely public wardrobe. She did a similar thing with Issa. With regards to this outfit, I thought it was beautiful if a little tight across the bust. The velvet ribbon was a perfect way to tie in the clutch bag. Racism is, unfortunately, alive and well in the UK, too. Blackface is not just a North American issue. I don’t think Admin politicized this issue, but rather brought to light some of the commentary out there – similar to how things have been done in the past. Perhaps this can be a good reminder for us all. Perhaps some introspection is in order before becoming defensive. Do I think Kate is racist and trying to make a statement with her dress? No, I don’t. Do I think her team was aware of the issue and brushed it off in their position of privilege? Perhaps. I concur 100% with your comments. Thank you for your intelligent observations. For all the incredible work this woman has done to improve the lives of children and families, at the sacrifice of a lifetime of her own personal freedoms and privacy, it saddens me that I cannot recall a single thread of comments in the past charged with such excitement and emotion of her actual causes and achievements. 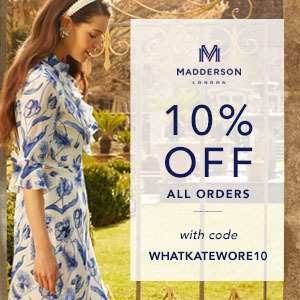 There will often be a passing “thank you” to the admins for including details on World War veterans or a new charity Kate undertakes, but beyond that the discussion is all about the clothes. It’s startling that the selection of a designer for one event elicits more opinion and commentary than any of the good she has ever done. All that being said, I think the dress is beautiful and ethereal and perfect for the event. Well…this is a blog about her fashion, rather than her work. However, Susan does a great job with also highlighting the work she does and profiling the Duchess’ many patronages. 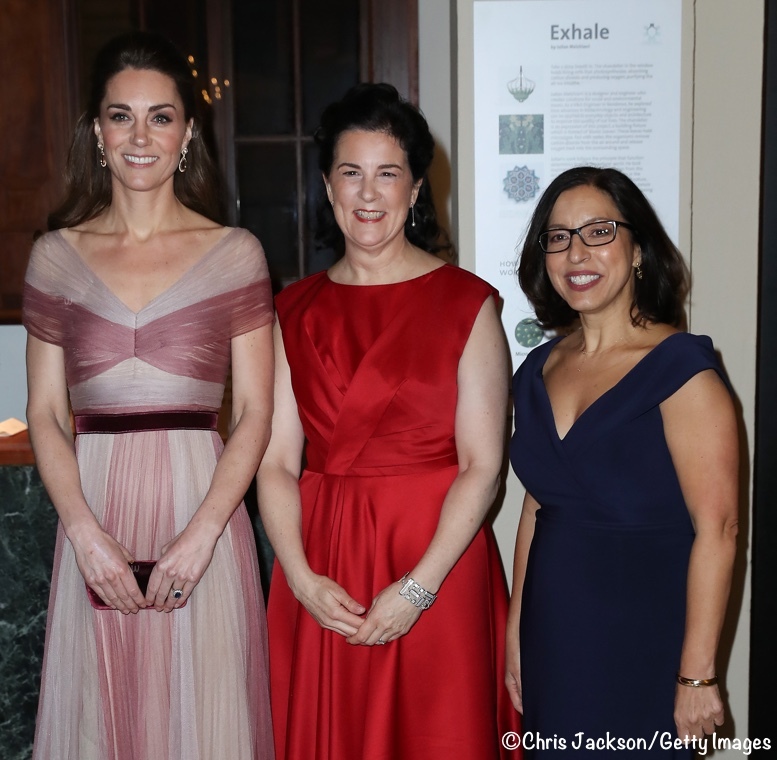 I’ve seen many thoughtful comments here about Kate’s work, especially those who are grateful for the work she does to promote mental health and wellness and child bereavement. MaryKate, Preppyhippy said it well. This blog is called WHAT KATE WORE so of course, people are going to discuss fashion. You are incorrect in implying that Kate’s good works are ignored. It is impossible to read Susan’s commentary and not learn about the causes. Many make mention of this good work. But the blog’s title does tell you the focus. Of course the focus of the site is intended to be fashion. As I said, that’s why it’s surprising that there are the number of comments today focused on a perceived political interpretation rather than the fashion of the dress. I think the admins go above and beyond in describing events and Kate’s work; it’s the reason I enjoy this site so much. But on any given day there are sporadic mentions of her work by commenters; I cannot recall a time that commenters applauded her work with the same energy devoted today to the perceived implications of the wearing of a particular designer. Well, we could chalk that up to the blog being about what Kate WORE, and these were a gown and suit that she wore, whereas her causes are things she does. But your point is taken. I love this dress. As I said on FB, it does remind of a superhero costume, but then Catherine is a superheroine. I love the colors, the design, the C’s signature belt, the fabric. While I get the comments about the shoes needing to match the bag, I tend to think they would look to dark and heavy next to the floaty fabric and pleating. I love seeing those special earrings again. In the hope that Catherine reads this blog and its comments, I say again, wear a bracelet, YRH. Please. In my opinion, it is fitting for the admin to include any “extended media coverage” Kate’s fashion choices create. I also appreciate that she chose to take the tack of “reporting on the reporters”, and noted that she included a list of times Kate wore the designers *because* she received multiple asks for the (extremely factual) information. Thank you for all your work, Susan! I am sorry this is the first time I’ve said it. This will always be the “breast binding” dress to me because that is what it looks like. I really wish I could love this dress, the flowy skirt, the pretty pink colors, the beautiful neckline, etc, but I can’t get past that it looks like breast binding from history past. Maybe if the entire bodice (heck, if the entire dress!) was the darker pink color instead of just the cross cross strapping around the breasts, this dress would have been stunning! Your comment is spot on! I agree. I wish the top was a solid color or vice versa and perhaps if she hadn’t added the belt. Also a necklace would have greatly helped the neckline. And I oddly wasn’t a fan of her typical half updo, either. Maybe it was a bit severe with the neckline? I loved the colors individually and the style of the gown, her shoes, her earrings. But the dress itself was only lovely from a distance when you didn’t see how washed out the colors were. I agree too! I really love the dress, except for the contrast on the bodice. It makes her shoulders look pulled and hunched forward, even though that’s not the case. I love the colours and the flow of the dress though. If it weren’t for that one feature, this would probably be one of my all time faves. I know the Royals have always made a habit of NOT becoming involved in any political matters (such as Kate not wearing black to last year’s BAFTAs to support the #metoo movement), but this was still a bit surprising to me. I know the gown must have been in the works even before the Gucci controversy popped up, but she does have an entire closet full of gowns that would probably have only needed slight alterations and would have been less of a faux-pas. One that jumps to the forefront of mind is the lilac Alexander McQueen she wore to the BAFTAs in 2011 (which I don’t believe she’s reworn yet). Controversies aside, I love this dress. I don’t agree that it would be uncomfortable. It doesn’t flatter her bust, but I still love the design. The colours, the fabric, the stitching, the way it moves- all fabulous. I love the added dusty rose velvet details. The earrings and shoes are fab. Looks wise, the ensemble is a win in my books! One teeny bit of criticism… I wish she had rocked the jaw-dropping blowout she had for her earlier engagement rather than curling her hair and putting it into a half updo!!! As always, she looks beautiful. I love how the dress flows as she moves. The shoes, hair, makeup, jewelry… all on point. The placement of the belt bothers me. You can just see the darker fabric right above the belt. I wish that the belt were slightly higher to cover the darker fabric. I think it bothers me because the belt draws my eye & the placement points out that the belt was an add on. Would love to see the dress without the belt. My goodness! I’m shocked everyone doesn’t love the dress. My first thought was Disney Princess! Love the dress, it’s so soft and floaty. A bit edgy for her but at the same time going safe with the belt. The earrings are not my favorite. I felt the dress was crying out for a major necklace. I agree the belt needed tacking, I wanted to reach out and fix it. It was probably challenging to pull off two very formal occasions so close together. While this hairstyle is not my fave, it would have been redundant to wear it up again. As far as designer controversy, not bothering me one way or the other. Her BAFTA look was SO on point and stunning, I knew it would be hard for her to pull a back to back formal look. I agree with many that this is a very pretty dress and it is very appropriate, but definitely not my favorite and it is the bodice. Something is just a little off with it. But the flowy material is lovely. I love those earrings, and I actually like the darker accessories. She is steering away from the matchy-matchy which I like. The brand issue is a difficult one, thank you for mentioning it. I agree with Ellis, above, that I’m glad this isn’t a blog that delves heavily into politics, but this is a topic directly relating to the subject of the site, so it’s not out of place. I have always been a little confused about the Duchess’s choice of D&G, especially as the controversy has been going on for such a long time, and they themselves have only fanned the flames of offence. It’s also true, though, that if we had to dismiss the creative output of any designer, artist, writer, etc., whose views we found objectionable, we might have very little of artistic merit to enjoy. We must all acknowledge that there are people who are great at their jobs but whose personal politics we could not endorse. As for the Duchess’s possible ignorance of the issues, it’s not beyond the realms of plausibility, although it would be an oversight given how carefully and diplomatically chosen her ensembles are. But even if the Duchess was not aware of the controversies, her stylist(s) and advisors surely cannot be. My thoughts were: (1) “bridesmaid dress”; (2) the bodice looks painful; (3) the colours on the bodice make it look like a top that is slipping off; (4) the belt looks like it slipped a bit and my OCD self wants to push it up to cover the darker pink; (5) the colour washes her out. She’ obviously beautiful and would look great in a potato sack, this is a miss for me. It has good elements, but her chest is just… Gone. Looks uncomfortable. And poor choice of brands, those scandals are recent, she could have changed outfits. The level of planning in her wardrobe must include second options in case of emergencies. This dress is not my favourite, the bodice is not perfect and the colours are not flattering, Kate looks washed out. The sparkling shoes don‘t match, my favourite was the Jenny Packham in 2013. Absolutely love this gown! Definitely one of her top evening looks, in my opinion. I’m never a fan of the half pony-tail look, on anyone, but I’m also glad she didn’t wear her hair completely down, which would have covered the gown’s neckline. It does look as if she’s stepping on the outermost layer of tulle / gauze, however! I like tonight’s gown and really want to love it, but something about it just seems a little off to me. I *think* the coloring is what’s bothering me; I would have loved to see the dress done in a bolder color (like the pink of the belt), with slightly different shades of the same tone instead of the contrasting pink and white. I do love the combination of the tight bodice with the flowing skirt, although the heavier fabric pales in comparison to the particularly airy skirt of Sunday’s McQueen (but what wouldn’t?). Susan: I am glad that you mentioned the issues with Dolce and Gabbana and Gucci. It’s difficult to figure out where to draw the line between politics and values, and you’ve always done a great job with that here. While I’m glad that this site stays away from political issues for the most part, being able to dismiss things like racism and sexual harassment and homophobia as “just politics” is a privilege that not everyone has, and I appreciate that you incorporate those things into posts when relevant. I still remember the class and dignity with which you handled the Pulse shooting, and as a member of the LGBTQ community, that acknowledgement made me feel welcomed and cared for during what was an incredibly difficult and painful week. I think most of the specific points I could make about the designers that Kate wore today have been iterated over and over by other commenters, but I’m very much in the “Gucci is excusable, D&G is not” camp. Domenico and Stefano are bullies (as in, they’ve actually engaged in a fair amount of legitimate cyberbullying) and they don’t deserve even implicit support from Kate. I don’t find it likely that there was any malice or intentional ignorance on the part of Kate and her staff, but I do hope that taking a few minutes to Google a designer becomes standard–for Kate’s sake as much as anyone else’s. Thank you for this comment as it made me reach a decision. While I have been loving this blog for a number of years now, this recent mention of ridiculous scandals and the hatred towards Dolce and Gabbana that I have seen in the comments, together with the acknowledgement that someone should be publicly shamed for wearing the brands of some people that simply have differing views from those of the majority, have made me reach the unfortunate conclusion that this space is no longer for me. I have wanted to pass this is as a once-in-a-lifetime mistake for this blog, but it is clear that the majority of its readers do not feel so and believe that the mainstream thought of the left is the rule that should dictate, while diversity of opinions is unwanted. This is the reason why such comments shouldn’t be posted next to Kate’s outfits if this blog doesn’t want to get political or create endless debates (but I guess that if most people don’t know much about politics, they take those claim at face value and assume it is OK to say such things). It saddens me, but this is the last time I am commenting here (if indeed my comment will even get published) and the last time I will be visiting the blog. Though I am only one reader of the many, I think someone needs to speak out about these issues and acknowledge them for what they are, even if I am running the risk of being labelled as someone that is making to much out of nothing, due to the lack of political knowledge of those putting the label on. i’m sorry you find a discussion of public shaming and bullying by a design house as political, and that you label the opinions here as “mainstream thought of the left” that should dictate, rather than a diversity of opinions. This isn’t a left-center-right issue. It’s much more a decency, kindness and rejection of cruelty and hate issue. In the end, no one can change what D&G feel privately, or their right to feel it. The fact that it’s shared in the “marketplace of ideas” makes it hate speech. None of us needs any more of it. As to Kate’s Gucci gown — I have really mixed feelings. When I first saw it I thought it was dreadful. After considering it for a bit, it’s actually very interesting and probably looks much better in person than in photographs which emphasize the bra-like aspect of the bodice. I’ll stay on the fence about it. Staying on the fence is not my usual habit, since I’m a political and opinionated person. As to Kate wearing D&G, I can make a lucid argument for both positions — wear or don’t wear. I lean toward don’t wear D&G, Kate. I lean center-left, too, here in blue Connecticut. It is always okay to have differing views. It is not okay to think racism or hate or any statement that puts people in danger are acceptable “views”. But (entirely aside from anything Gucci or D&G have done, about which I know very little) it might be time to stop seeing racism, hate and phobias in every less-than-PC comment or action. It would make the world a kinder, calmer place. Amen SaraF! Sometimes clothes are just clothes. It would make the world a calmer place – for people that are not affected by racism or hatred. Some people’s lives are political because of the color of the skin, where they were born, who they love, etc. We don’t get to chose those things – and I want a kinder, calmer world for everyone. We’ve never made progress by ignoring problems. This comment is not at all argumentative, but where do you get the idea that “diversity of opinion is unwanted” on this blog? Politics is rarely the rule of the day here, yet when there are remarks not fashion-oriented, posts are respectful, and the administrator is respectful. As someone who is also slightly right of center, I am constantly amazed that both sides seem to think that their opinions are not welcome in any public arena. Self-victimization does not lead to healthy debate. I am sorry that you’re leaving, and I’d be willing to bet that Susan and her readers are too. I’m sorry that you feel a mention of a designer’s history of shameful racism is “political”. I’m glad that it was mentioned. It really isn’t a matter of politics or left-center-right. It’s a matter of human decency. An entire race of people are continually faced with hate and intolerance on a daily basis. It’s important to point out fashion houses who engage in said intolerance. Also, I don’t think anyone here is really even criticizing the DoC. Just noting that it would be a good idea to perhaps google a brand before wearing it. She is a future Queen Consort. It’s really the least that her team can do. Her people come in all shades. That said, I’m sorry to see you go. I absolutely love this blog and WMW and everyone’s efforts in staying positive. Hear, hear. I’m so glad this point was put into just these words, Ellis. Not everyone has the luxury of ignoring these issues–please remember many face them every day whether they want to or not. As Mary says elsewhere in the comments, Kate always makes a strange choice for this event. Though looking back, I’m starting to dig the Erdem in comparison to the others. I like the material and movement of this dress, but I agree with many others in disliking the dark criss cross. It looks odd and unflattering. I wonder if she is wearing the dress as it was designed or did her own adjustment like she did with the inky blue Packham. I imagine if the top pink layer were scrunched down closer to the dark color and off the shoulder, the dress would look very different. I understand that she might be more comfortable with it over the shoulder, but I’m trying to understand the designer’s decision here! The Gucci “scandal” over a simple ambiguous design with an immediate apology to anyone who might have been offended is so far away from D&G’s ongoing offensive remarks and non-apologies. To compare the two brands is simply trying to create a pattern for DoC where there is none for the sake of a story. Commenting on fashion houses missteps in the media is not political. The discussion of media and public opinion is not related to the government or a political party at all. It is not “political” to have an opinion on statements made by a celebrity (designer in this case) or to report on the results of those statements, which again, have nothing to do with government or legislation. WKW is not “getting political” by simply reporting fashion news as it relates to what Kate wears. I like the dress but I can see why so many people have qualms about the bodice. I do actually think the dress for me would elevate to a “love” if the whole bodice were that darker rose color, and the skirt was still the ombre. She looks really beautiful overall, and I almost liked this dress. The textures and colors are interesting and work well on the skirt, but the top is another story. I agree with many others that her chest appears flattened, but additionally the placement of the colored portion seems too low and has the effect of making her bustline look lower than it is. Altogether unflattering. I think it would have been lovely if not so tight and if the colored portion was a more vertical shape. Finally the belt cuts her in half and seems out of place. The dress is alright but nothing too special. The colours don’t really work for Kate. In terms of the political debate over the brands I’m not sure the issues have had so much publicity in the UK. I had not heard of them and I thought I was in touch with fashion news!! I’ll now educate myself about them. Kate’s choices of style and cut are still very much within a channel of “norm” and are variations on a steady theme. I wish for something more edgy. And more bling from the jewel vault! I love the lines of the dress, and the color itself, but not the stripes of color, the variegated look. Also it unfortunately seems to flatten her chest as others have noted. How ridiculous the comments are concerning her ‘woke’ choices. Perhaps she is sending a message – a dress is at the end of the day, only a dress. Not to mention that I find the criticism on Gucci to be entirely unjustified, based on the hypersensitivities of leftist propaganda. I thought that this blog wasn’ t going to be dragged under such views and I hope this is the last time I will be seeing such mentions. I do not know about any scandal regarding D&G, but I’d bet it is most of the time just as ridiculous as the accussations against Gucci. On a side note, but the actual important comment is how elegant, beautiful and appropriate the Duchess looks tonight. Anyone who’d ignore that in favour of mindless comments regarding the brands who designed dresses is someone who believes, as many of the left do, that moral education with left values should be spread around everywhere and esthetic values should become ethical ones. I am saying this again in the off-chance my comment won’t be published but hopefully at least read by someone that moderates the content posted here, I hope this is the last time I see such political comments regarding her outfits on this blog. And I also hope my comment gets published, otherwise, I will see this as a serious form of censorship. If the blog post mentions politics, so should the comments. Well, here goes. Since Admin posted your entry, I feel free to respond. First, Admin is the blog publisher and can print whatever she wants. Second, as readers we can advocate to keep the blog lighthearted and free of politics. Third, if Admin sees a serious problem such as racism she should comment. In this instance I agree with Adriana. Looking at the Gucci sweater did not at all remind me of any particular race of people. Those who enjoy being offended at every turn in life should not dictate mass offense at nothing. IMHO Gucci was guilty of offering a ridiculous piece of fashion, which I doubt any woman wanted to wear. I like to read about KM’s look and comment on how gorgeous she is. I also like to keep it light. I guess the blog’s readership as a whole will dictate the direction Admin takes. We can like it or lump it. Your comment sounds angry and political. Acknowledging the controversy surrounding the sartorial choices featured here is one thing, but using this platform to voice your political views is definitely not appropriate on a fashion blog. I respectfully disagree with your interpretation of Adriana’s remarks. I suggest you educate yourself on D&G’s problematic history of racially offensive and homophobic actions and comments. Not about to list them all here but they have been controversial for awhile. To dismiss the evidence and claims against them for being offensive and just merely “political” is to dismiss the groups of people (already marginalized to begin with) who have continually been swept aside with comments like yours. And that kind of comment can only come from a place of privilege. How could anything compare at how she looked at the BAftas? This dress flowed beautifully but looked too long as many photos showing her stepping on the chiffon. The neckline was lovely on her but to me it begged for a delicious necklace from the Queens collection!!!!! But not a fan of the crisscross band effect. Not my favorite. That being said she is always a beautiful women for all of us to fawn over and admire! What a great couple of DOC days. Thank you for all your hard work at getting us the bet pics and info! I’m one of the few that find the dress and her whole look absolutely stunning. I love the “thready” well-fitted bodice, the dream-like floaty-ness of the skirt, the pink colors, the accessories, everything. I think she looks amazing. I think the whole design of the dress is lovely, feminine, and yet unusual and interesting in so many ways. Just fabulous. You’re not one of the few: I agree wholeheartedly. Totally agree!! My jaw dropped when I saw pictures last night. I want to own this dress and wear it over and over. Agree – love the look very much. I love even more that it seems like she’s enjoying the fashion side of the job a bit more. Seems to me that her approach this year (post maternity leave) was to repeat the dayware, and “save up” for some truly stunning evening wear. Add me to one of the “few.” I think she looks absolutely stunning. I agree with e every word you said, she looks lovely. Thou there are a few issues, the pleated tulle shirt needed to be cut at least inch and a half shorter in the front, because in all the pictures you can see Kate stepping on the material. I think the waistline that was accent with a velvet band was requested by Kate, it should have been tack so it did not move around. I have said this before, there should be a in-house tailor that does these last minute alterations when there are changes with shoes, belts etc. I agree with you completely as well! I expected to see an overwhelming amount of positive feedback about this dress and I’m disappointed that’s not the case. So disappointed in fact that I felt compelled to comment for the first time. It’s such a gorgeous look!! Catherine looks stunning, not that that’s unusual! I love the Gucci floaty, flowing gown, the muted pinks with the burgundy velvet accessories. Crazy about those Morganite/diamond Kiki McDonough earrings. Morganite is a particular favourite of mine and these earrings couldn’t be more perfect with the dress. I do wish the dress didn’t flatten her out so much, and I would rather have seen her be brave and go with a strappy sandal in a muted pink satin or sparkly silver with a complementary nail polish colour other than clear. This dress isn’t a favourite of mine, though as always she looks perfectly lovely. I do think it’s very interesting to consider the decision to wear not one but two controversial brands in a single day. I’ve so often seen comments on this site praising her “sartorial diplomacy”, the intention with which she selects particular designers and styles on tour and in some cases at home. When in Canada (where I live) she is quite literal with the maple leafs and red and white. I do think it makes her seem a bit out of touch not to have realized that wearing these two brands in such quick succession might deflect attention from her causes and stir controversy. Maybe it is her prerogative to be oblivious to repeated offensive statements like what we’ve seen from D&G, but I’m surprised her team doesn’t seem to have intervened. Oh well. As I say, she does look lovely and I do always appreciate when she makes a speech, as I understand it makes her rather uncomfortable to do so. Even releasing a white tennis shoe invites calls of racism. The trend to finding something offensive about anything is getting old and tiresome. Not everything has a hidden agenda and sublimal messages of racism aren’t as rampant as activists want us to believe. The Duchess probably was not making any kind of statement on what many see as false cries of racism. Love the earrings. Love the clutch. The dress…not so much. Color wise, it washes her out. The bodice is flattening her chest. I just don’t get the velvet ribbon at the waist. She seems to add ribbons to many of her designer dresses. Love Kate though. Always represents the royal family very well. But I do agree that with all the controversy with D&G and Gucci, maybe not the best choices for now anyway. This shape, cut and flow of this dress are perfect for her shape. Unfortunately the color is all wrong for her and, as others noted, it looks like she is wearing a bra on the outside of the dress. And I just can’t get past that. It makes it a major miss for me. On the political note, I don’t at all mind WKW acknowledging the controversial issues involved with these brands, although as one reader pointed out, I am not knowledgeable enough to issue my opinion on it (as if the world was waiting, haha). However I think it fair to point out that lots of other brands, who are not in hot water at the moment over race issues, use wage slavery and unsustainable methods to produce their clothing (think back to the headline a few months ago about how much Burberry wasted in destroying unbought clothes). Consciencous fashion requires a much more holistic view than simply decrying brands whose marketing teams make major errors. Well said. I am hoping that both Kate and Meghan will start to embrace the Slow fashion more ethical brands of clothing. They are both in a position to highlight the impact of the clothing industry on the environment. Agreed! It would be awesome to see them use their platform to bring more attention to this. I whole heatedly agree with your comment. Gucci may be on the hotseat right now, but ethical fashion is a much broader issue. It’s not her priority at this time, and I’m not judging her. To pick and choose issues (of the moment) and overlook the broader context would be silly and disingenuous. This is an interesting point – food for thought! I think I love this look. I feel like the style of the bodice makes her look a bit restricted and flat chested. But otherwise I’m a fan. The color palette is gorgeous — I am a huge fan of dusty rosy hues with burgundy. And the fabric is so elegant. And in general it’s just fun to see her in yet another evening down, but one that doesn’t look like any she’s worn before. Those earrings are amazing and I like her hairstyle this evening. Overall looking chic and modern. I like the dress, but the colors wash her out. The shoes seem off, but I do like the belt. Regardless, she wore two brands that have come under scrutiny for racist issues. There is so much thought given to everything she wears, and this is really disappointing. What a true beauty! So regal. Her hair is amazing, her makeup smashing and the style of these evening gowns – wow! Tonight’s gown itself, in my opinion, was a miss. I don’t like the colors and agree with other comments that the top looked too “bra like.” There was also something odd about the seam in the middle of the bodice that, to me, seemed to cheapen the look. Especially when compared to the beautiful side draping is the inky blue dress she wore several years ago. All that said – the way she carries herself mad her gorgeous hair and makeup makes the dress less of a miss. She’s such a dream! Totally agree about how she carries herself. I often wonder if she (and Meghan) ever dress in the planned outfit for the day only to be disappointed or anxious with how it looks or feels at the last moment…. and assuming there is not always an easy or timely plan B! Goes to show it’s how she carries herself that really shines. Not a fan of the top part of the dress, it’s reading She-Ra to me. Her hair looks half up to me, not down? I would’ve liked to see it down or up like BAFTAs. Blah color combo that does nothing for her. IMO, a big step down from the beautiful gown she wore last night. I won’t be sorry if this one slips to the back of the closet. I agree. I don’t think the bodice is flattering and also the color isn’t the best on her. Regardless, she’s a beauty in anything she wears. This year’s Bafta dress was just so perfect, any gown worn in the same week would suffer by comparison. The Duchess looks beautiful and appropriate as always but I don’t love this. Is the rose draping/ruching on the bodice meant to be darker than the rose panels on the skirt? Does the lighting just make it appear darker? I’d probably like the gown better if the rose on top was more subtle. To all female persons: Never, ever stand next to KM. She is a goddess, and you will not come off well against her. Yes! I remember thinking the same thing of that photo when Kate and Reese met! My immediate reaction was ‘what is going on with that dress?’ And I still feel that way. The different hues, the velvet belt, the velvet clutch. Nope. I think it would have worked better without the matching belt and clutch. Beautiful gown! She’s having a Cinderella week. Tonight’s reminded me of the inky blue Jenny Packham, with the draped tulle, wide neckline and the tulle wrapping her upper arm. I agree, a great week. I think she so often wears some sort of accent at the waist because she needs to. She is long-waisted, and without a waist decoration, or set-in waistband as we saw in the McQueen at BAFTA, she would look too undefined and unfinished. As for controversy, she may not know. While I liked the look of both outfits today, especially this evenings dress, the choice of designers was a poor one. Although Kate herself may not know about the recent racism scandals surrounding DG and Gucci, her staff 100% should. While the recent DG scandal happened several months ago, the Gucci scandal is quite recent. And though her sartorial choices are obviously planned in advance, she has plenty of day suits and evening gowns in her wardrobe that could be re-worn in the event of an emergency. This (lovely) dress could have been saved for later. Also, I don’t feel that bringing up these controversies politicizes anything. This is a site that follows royal activity and fashion. Controversies surrounding fashion designers the royals choose to wear are relevant. Royals are very aware that their fashion choices send a message. We acknowledge that often when we mention sartorial diplomacy/wearing local brands on a tour or wearing up and coming brands, ethical brands, and heritage brands. All of this sends a message. Wearing brands that have been recently involved in racism scandals does not send the right message. And unfortunately it happened twice in the same day today. I like the gown and I sort of don’t like the gown. I think because of the colors and the way its draped that it is sort of a trompe l’oeil effect that it almost makes her look bulging around the waistline just because of the skin-color fabric and the shifty waistband. Something about it is off. And of course a gorgeous neckline that was just calling for a big gem necklace. If Catherine were to avoid all fashion labels that were attached to controversy she’d basically have to knit her outfits from recycled yarn because all the houses have some issue or another. It is funny how we “rank” the priceyness of labels – like I remember the Chanel was such a treat! But realistically, McQueen is just as expensive as Gucci (to my knowledge) but because she wears it so often, we don’t think much of it. I feel like this dress is a very “Duchess” take on the crop top dresses we’ve been seeing on celebrities. At first glance it has that look without actually showing too much torso! I like the dress. I like the velvet band. Hair looks gorgeous. Love the earrings. I don’t know enough about the labels scandal to make a judgement. My first issue is the shoes. They are beautiful, but I don’t think they go it’s the rest of the outfit. The sparkley bright glitzy look doesn’t seem to fit with the softer and deep colours and velvet fabric. I feel like the shoe should have matched the belt or clutch. Second, it seemed in a lot of the photos she was stepping on the edge of the dress. Like it wasn’t hemmed right. …. I have mixed feelings about this dress. I do like the pretty, variegated shades of pink. I also like the floaty, flowing drape of the material. But I dislike the crisscross bra effect of the top. It reminds me of a 16 year old actress binding her breasts to play the part of a 12 year old, or to play a boy. The plum sash and purse are very nice with the pink and I do wonder, since Kate has them, why the same colour shoes weren’t worn. The earrings are perfect to complete this ensemble. I like this dress but also wondered about the shoes. Velvet shoes which matched the sash would have looked really sharp. Perhaps she couldn’t find a pair? Kate does not seem to ever go the route of having her shoes dyed to match. But she wore shoes that match the clutch to Eugenie’s wedding. I thought about this and I think a dark shoe would have spoiled the effect of the lightweight, floaty hem. I love it! Looks amazing. Wonder if the belt is the same from the Erdem tweed dress? I’m going to have to “fan out” and be completely American: tonight’s look make three slam dunks in a row for the Duchess…wonderful! (Yes, I said it: slam dunk. See “Basketball; NBA.”) The white McQueen at the BAFTA Awards, the D&G tweed suit from this morning and now this gorgeous pink Gucci gown…WOW. Did she get a new stylist or something? A great week for Catherine, style-wise, and it’s only Wednesday. Why did WKW have to politicize this wonderful site? I am disappointed and feel sad this has happened to a place I come to escape partisan issues. I do not think the Duchess has to be “woke”. That is a demeaning statement. However I am hopeful my comment will be published and this site will allow free speech. Getting back to fashion I think Kate looks amazing with the different tones and pretty accessories. Her morganite earrings are stunning. Given that many people have commented on the Duchess’s choice to wear D&G earlier today with respect to their ongoing controversy, acknowledging the recent issue with Gucci seems fair. The admins have always been fabulous at presenting the total story of the Duchess’s choices and charities, from the fashion to the ethics to the social impacts. To the best of my understanding, they didn’t suggest they the Duchess wasn’t “woke,” it was a quote from another site. Acknowledging things happening in the fashion world isn’t the same as politicizing things. Respectfully I wonder if we all looked in our own closets what controversies we would find? I think we should let the duchess do what she does best and not worry about what politics are involved in the world. By including the quote unfortunately they are opening a channel beyond fashion. I do agree the admins are supportive and champion the Duchess. Perhaps next time they can clarify if they agree with such a quote if it states an unfair or demeaning view? Otherwise it Is left to us to surmise what they meant by publishing it? Respectfully, rather than being told what to think I’m pleased the admins published the information in an unbiased way, allowing the reader to make up her own mind. absolutely agree. If Kate decided to wear something that did not have some sort of criticism levelled at a brand then she would be spinning her own yarn, weaving fabric, growing veggies and stomping her own wine grapes!!. I think sometimes you just have to rise above everything and be your own person and this is what Kate seems to be doing. I don’t believe that anyone was physically harmed or hurt and how anyone can suggest the Duchess needs to be more awake is really just plain silly, anyone that has ever worked in PR would understand how communication is everything. I think we all remember at an event where the majority of guests wore black but the Duchess chose dark green. Yes they made a statement but all has gone relatively quiet and there are still women being assaulted each and every day. You just can’t come out in a black frock one day of the year and pretend that everything will be ok.
By the way I think Kate looks magnificent!! I couldn’t agree more about the ‘woke’ comment. It is very demeaning. As if someone who is not ‘woke’ is lacking. Honestly I think people are blowing things out of proportion and wanting to create drama where there isn’t any. I also agree it was wrong to bring in politics and the ridiculousness of being ‘woke’. Let’s just stick to fashion! This site discusses fashion. The fashion brands mentioned are involved in important scandals, and the whole fashion world is addressing the issue. Why not here? I think it would be weird not to mention it, to say the least (c’mon, 2 controversial brands in one day). I love the colors of this dress so much, that all other criticisms float away. I think the colors complement her fair complexion and dark hair. I think the earrings are the perfect touch — a ruby might have been too matchy. I think the bodice looks a little flat, like it’s been woven too tightly around her. And I don’t really like the belt, which looks like it was added to just to match the clutch, which seems unnecessary. But the colors of the dress and the flowing fabric more than make up for it. A definite hit for me! She always has to add a belt, lol. I love the design and flow of this gown. The only thing ruining a 10/10 score in my opinion are the colors. It reminded me of blood more than anything with the contrasting tulle colored pieces side by side! The good thing is that she accessorized wonderfully. I’m obsessed with those shoes! Very pretty dress. Like the soft pink colour. Well. This is miles better than last year’s dress, not that that was a hard feat 😅 I like this dress but it’s far from my favorites. Love the hair and earrings. As for her makeup…I like The blush tonight. Usually not a fan of her makeup looks. I do wish she changed the way she did her eyebrows. Golly, I LOVED that Erdem number from last year 😍. There was no middle ground with last year’s Erdem dress You either loved it or hated it. For me it was the all time, absolute worse thing I have ever seen Kate wear. Really? Worse than the mustard Erdem in Scandinavia? That one gets my nomination for worst-ever. SaraF. Well for me the second worse was the mustard Erdem. They both were memorable…but not in a good way. Me too! One of my all time favorites, along with last year’s Bafta McQueen. I love it when she goes bold. Not so much when she does the princess/Cinderella thing. I find I am undecided on this one. I like the detail, movement and the cut of the dress. I like that the two colors draw attention to the detail but I don’t actually like the effect of the two colors. I too think perhaps all pink would have been better. I also agree that a burgundy shoe would have been better and would have liked to see the belt tacked in place as it seems to have moved. Also, the hair today was on point. I looks really healthy and full. Also, do Brits celebrate Valentine’s Day because this dress does seem appropriate? I love the shape of the dress and the way the fabric moves, but I don’t like the banding of the colors. The top looks too much like a bra worn on the exterior of the dress and the skirt resembles a circus tent. I like the skirt of this dress, which is very flowy, similar to the one she wore to the BAFTA’s. I’m not a fan of the bodice, however. It is, to me, reminiscent of one of those tacky Harve Leger bandage dresses. It also makes her breasts look very low. I’m also not a fan of the morganite earrings with the dress. I would have loved to see something in a rosier color. Morganite is too brown. Lastly, the half-up, half-down hairdo isn’t formal enough for the occasion. If the event demands a full-length dress, I think long hair should be put up. Not one of her best looks tonight in my opinion, unfortunately. I’m enjoying the combination of these colors which reminds me of champagne and rose (rose as in wine)! 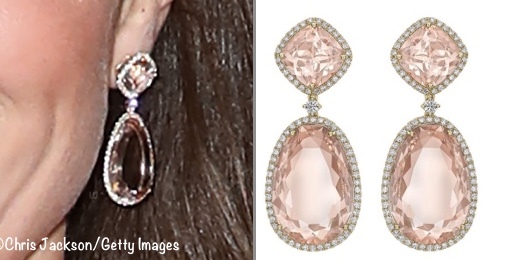 Like the sparkle in Kate’s morganite and diamond earrings and in her Cabrina pumps. The only thing I’d change is the dark burgundy velvet band around her waist. The color seems too dark and the band ill placed. That horizontal strip of rose tulle above the burgundy velvet band looks odd. It confuses me where Kate’s waistline is. It would be nice to see the gown without the dark velvet band. Possibly being obtuse but I suspect the Duchess didn’t realize the political implications of her label choices. Perhaps her staff should be more in tune with these things. But if word got out she struck a gown for these reasons would that be viewed as political activism inappropriate for her role? I don’t know. She always has complexities to consider. Regarding this dress, I’m honestly on the fence. The bodice bothers me and looks like a bandage binding of some sort to my eye. It hit me that way instantly and I haven’t been able to talk myself out of it. That said, a beautiful woman for a worthy cause and I hope she enjoyed herself. We share the same thought, that the Duchess did not know of either situation. Something Natasha Archer, said to be her stylist, should be aware of, but she is on maternity leave. Ah I’d forgotten that! That is certainly a factor. Then why would you print that she needed to be “woke” and show all the examples of when she wore the designers? I love this site because it typically avoids politics. It is disappointing to have it included in today’s post and I do hope it does not become a habit. WKW is such a lovely place to turn at the end of a day. Hopefully it will stay that way. Thank you for all your hard work that we all enjoy! I don’t believe Susan was suggesting that Kate should be ‘woke’, rather, she was quoting an article that said this. I agree that the controversial element of the designers was the ‘elephant in the room’ and needed a mention. I also don’t believe this is ‘politicising’ this site any more then pointing out other ethical elements of fashion politicises it. Thanks as ever, Susan, for walking a fine line with the blog, keeping it about the clothes rather than the wearer and keeping everything respectful. I genuinely don’t think Kate knew either. Lots of people don’t and I doubt fashion designer controversies are something she stays on top off unless it becomes huge front page news like the past issues with Marchesa. I know the D&G issue has not received much attention at all here in England. When I have mentioned it to people they have no idea what I am talking about and as one example Lady Kitty Spencer is still happily endorsing them. I will say this is absolutely something her stylist should 100% be paying attention to. That’s part of the stylist’s job and they let her down this time. It was such a great day for Kate and her causes, it’s a shame for it to now be marred by this issue around the dress designers. It’s still a great day and only marred if you let it be marred. We shouldn’t let it take away from the good she is doing. It is likely that she didn’t know. I’m guessing most don’t know. I didn’t know. I had to do some googling to find out what everyone was referring to. But, how much time must elapse before its enough? Anyway, it’s a beautiful dress,the fit is perfect, she looks gorgeous. I will say the color doesn’t really compliment her greatly, but she looks beautiful just the same. AH-MAZING. I just love the cut and flowy skirt. Gorgeous. The colors are also amazing. At first I was a bit stunned by the highlighting of the bra area in the burgundy color, but once you look at it for a few moments that shock goes away and it’s just a gorgeous lovely dress. Two gowns in one week! I love this dress with the exception of the light pink in the shoulders. Would’ve loved to see the dark pink carried all the way up. I also would’ve loved a big diamond (or ruby!) necklace here. Otherwise, it’s perfection. Oohhh love the idea of a ruby necklace! So I think the ruby necklace would have been tremendous. I find myself at a loss for words; in the very best way, I am stunned speechless. There was no denying the fabulousness of the McQueen we saw earlier this week, but it fell well within the bandwidth of “safe”. There is nothing safe here, from the choice of the design house to the dress itself. And so I think it climbs a notch higher in my book for pairing a huge amount of risk with exquisite execution. This dress, like the Erdem before it, will, I think, leave very few with mild opinions, so I’m looking forward to seeing this community’s thoughts on it. I like the dress. It is reminiscent of the inky blue Packham that is one of my all time favorites and I like the sort of ombre effect that elevates it beyond a typical boring blush color. As to the controversies, I mentioned the DG one on the previous post because I think it was a bad choice even though I loved the suit. I don’t feel the same about Gucci because it was one bad design that I don’t think was intentional and was handled decisively when it learned of the controversy. In contrast, D&G repeatedly say and do bad things and sometimes apologize when people get angry. To me, this Gucci is not problematic but the DG outfits very much are. No prob. I appreciate you covering it because I do think it is relevant. Fashion isn’t always *just* fashion and can have wider reaching implications. I think it is also entirely possible Kate was not aware of the Gucci controversy (which for the reasons I said above, should not necessarily have stopped her from wearing the dress). I would find it hard to believe that she is totally oblivious to the D&G stuff though…it has sadly been going on for years and has made a lot of news, especially in England when they attacked Elton John. I myself had always liked a lot of their work but their conduct has turned me off. Also, I’m sure this dress was planned long in advance and the Gucci event just recently happened. Probably would be difficult to change an evening gown last minute! This was my thought, too. Too late to change. I loved the Gucci she wore in 2017 and was surprised she’s chosen the brand on only two occasions. As for D&G, apart from years of bad behavior, I have disliked everything she’s worn from this label. Some of the styles were unflattering—others were similar to other brands that executed the design much better. This is exactly how I feel as well. Gucci made what seemed like a genuine mistake, immediately pulled the offending product, and seems to be making amends (Prada had a similar response to their blackface-invoking merchandise a few months ago and just announced what seems like a very well thought out effort–led by two black Americans–to diversify their company). Dolce and Gabbana, as you mentioned, have never really seemed to care about apologizing for anything they say. Some of their designs are absolutely beautiful, but I’m kind of just done with them. I do wonder if Kate had already had the D&G suit made before Stefano Gabbana’s comments about China in November. I still don’t think that the label was the best option for today, but I would feel also feel uneasy about an item of clothing that likely took a large amount of time and resources to produce going to waste. I’m sure that Kate knows full well that she’s implicitly endorsing anything she wears, so hopefully this is the last D&G we’ll see her wear. I love the velvet accessories here, but does that belt look just a tad bit skewed in all of the pictures? There’s something a bit off about it on Kate’s right side, to my eye. The plum colors are beautiful. I’m a bit surprised – maybe even dismayed – by the choices of designers. It just comes off as a little tone-deaf or disconnected from the wider world, as if she’s a bit above it or not paying attention. That’s her prerogative though, of course, and may be accurate in some ways. Or she simply plans her outfits (especially her more formal outfits) month to weeks in advance of an event and was too far along in the process to keep up with what the latest outrage on social media might be. Especially since it appears she gets most her outfits custom fitted by either the designer or a professional seamstress, I would imagine that she doesn’t just go to her closet the night before pick out an outfit for an event, but that there is a fairly lengthy process of fittings and picking accessories and by the day event comes she simply puts on what has been picked out, without giving it much thought at that point. Still, there is likely another dress she could have worn at the last minute. I am sure of it. That is a beautiful dress. I love the waist ribbon and clutch. We are getting spoiled with her amazing fashions this week. I love this dress, but does anyone else think the darker pink detailing on the bodice looks just like a bra? When I first glimpsed this dress in a video posted on Twitter, I thought “Wow, that’s a low-cut dress!” Then I saw the paler bit above the dark pink section and it looked much better! That was exactly my first impression, also! It immediately brought to mind the time, years ago, that my daughter’s synchronized skating team came on the ice for a practice wearing sports bars OVER their leotards! But as for this dress, I grew to love it after a few minutes. I put this into the category … only a very few women could wear this! One needs to have a very slender build to carry off that kind of accentuation to the upper body. Thank you for addressing the choice of brands today. I appreciate all of your hard work and love that this is usually a space for fashion and fashion alone but today seemed to be a case where the fashion statement needed to be addressed. As for tonight’s dress, especially in the photo with her holding a bouquet, this came across as very bridesmaid to me. I am smitten by this dress. It embodies all that’s best of classic and elegant with a completely unique twist of originality which takes it into a style sphere all of its own. Sunray pleats have been done often enough, but to play on them like this from an almost nakedly plain bodice seam to the cunning use of simple contrast bands of fabric in such unusual construction is plain genius. The colours are so gorgeous, the soft baby pink against a dusky rose tone is pure enchantment. The gathered bodice fabric is reminiscent of at least half a dozen Packham gowns Kate has worn before, and the floating full skirt brings to mind McQueen we were talking about just last Sunday, but these signature Kate features have been owned by the contrast bodice and shoulder band, and the softer bands of contrast in the skirt. That stark upright front seam at the centre of radiating soft gathers gives its own smart edge amid the girly chiffon. Belt and clutch offer the perfect touch of definition in a hint of darker plum. Kate’s semi-updo is charming and loose, completely in keeping with the soft drapes of her dress, her use of jewellery admirably restricted to statement drop earrings, and how perfectly wonderful that Kate should of course happen to have a spare pair of silver glitter pumps in which to go to yet another ball in true princess style. A triumph. I am on the fence about this dress. I like the style but, I do not like the pink and white bodice or, the way the colours were used. I think it would have looked much better big the bodice was all pink and the skirt had more pink chiffon with maybe an overlay of the white. I also think burgundy velvet shoes would have looked much better. She does look beautiful. I love those earrings. I’m personally not on the fence about the dress; I love it. But I agree with you that somehow the shoes feel off. Something in a warmer tone would have been better, although I don’t know that I would go with a dark color against the airiness of the skirt.